Darien seniors pose with Jim Mulhearn. L to R: Jack Tyrell, George Reed, Jim Mulhearn, Tim Lochtefeld, Will Hamernick. DARIEN—Darien football lost a member of its family over the weekend. Jim Mulhearn, the Blue Wave’s unofficial 12th man passed away Saturday, he had ALS. "Jim was the heart and soul of Darien football and he embodied our program’s mentality with his ‘never give up’ attitude," graduated former-captain George Reed said. "We all felt that Jim lived vicariously through the team and when our successes came he was right alongside of us and just as important as any other player on the team." As soon as coach Rob Trifone met Mulhearn several summers ago at Roton Point he was drawn to the man’s personality and outlook on life. Mulhearn was a football fan, and was wearing a Greenwich football hat when Trifone met him. The Blue Wave coach worked quickly to turn his loyalty to Darien. "I of course teased him and quickly gave him a Blue Wave football hat," Trifone said. "And told him he was not allowed to wear the Greenwich hat around me anymore." Trifone attempted to get Mulhearn down to the Blue Wave’s home game against Greenwich in 2013, a game won handily by Darien, but because of weather issues and Mulhearn needing special assistance with his wheelchair he was unable to make the contest. Trifone had told his players of the plan to have Mulhearn to the game, and their reaction after the fact has stuck out to the coach to this day. "Instead of gloating over an impressive victory over powerhouse Greenwich, that group of teenage athletes only had one question: where was my friend Jim?" Trifone said. "They all wanted to meet him and shake his hand, I was blown away by their reaction and have never forgotten it as you can tell." Trifone tried to get Mulhearn to a couple of games in 2013 but it never worked out, so last summer in late August he had Mulhearn come to practice to watch the team complete the ALS Ice Bucket Challenge. The team dumped buckets of ice water on themselves in order to raise awareness and money for the disease. After that Mulhearn became a staple at Darien football games, and he was welcomed with open arms by the team. "Every single athlete was just as amazed as I had been in my relationship with Jim, at how positive a man could be, who was bound to a wheelchair and struggled with his speech," Trifone said. "Jim motivated those athletes the same way he had motivated me, as all of us are guilty about dwelling over the small things in life and here this man faced with the biggest challenge in his life would not let it drag him down." Each player made it a point to shake Mulhearn’s hand before and after games, they took care of him in inclement weather, setting up a tent or wheeling him in front of the sideline heaters and making sure he was covered in blankets. When Mulhearn spoke to the players after games they listened with intent. 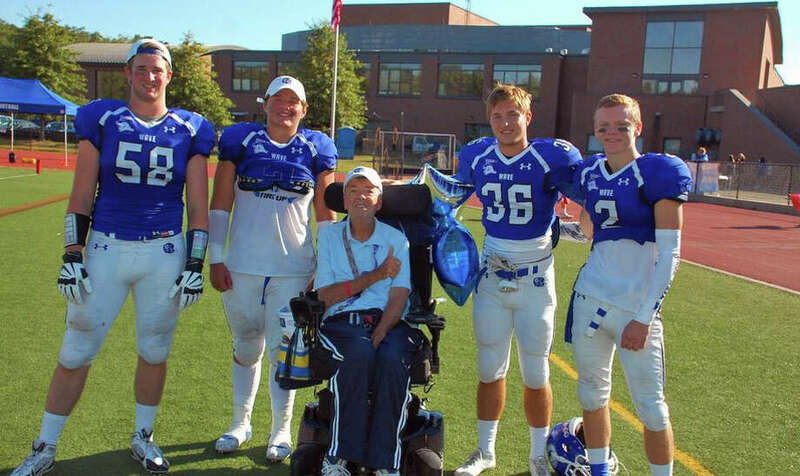 Despite his debilitating condition Mulhearn lived his life to the fullest, and in the process taught the young men of Darien life-lessons that are invaluable to their future. Trifone last saw Mulhearn in the final week in July, just days before his passing, and he let Mulhearn and his wife know the impact he had made on the team. "In the end, his wife Ellen could not thank me and the team enough for the love and support that they had given Jim," Trifone said. "On that last day, I gave Jim a Blue Wave football helmet and told him that in 2015 every single member of our team will wear the decal "JM" on the back of our helmets in memory of a man who taught them that no obstacle in life is too big when it comes to friendship and love."